Tile cleaning is tough work. Grout cleaning is even harder, especially, if you’re using a toothbrush and elbow grease, but a quick phone call or email to schedule tile and grout deep cleaning services with Beyond Stone Solutions can change all that. Our trained technicians use specialized equipment to extract deeply embedded dirt and grime, thoroughly cleaning and sanitizing your tile, grout, and baseboards. We use nonabrasive yet effective methods with adjustable heat and pressure for deep-down clean. We can resolve a host of tile and grout problems, such as grout replacement, fixing grout cracks, tile replacement, as well as tile installation and tile repair. 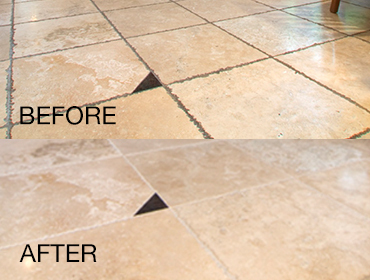 For a free estimate on deep cleaning tile and grout services, including grout sealing or grout color sealing services, throughout the Phoenix, Scottsdale, and Tempe area, use our contact form or call (602) 993-9800 today!